Make learning fun and nutritious! 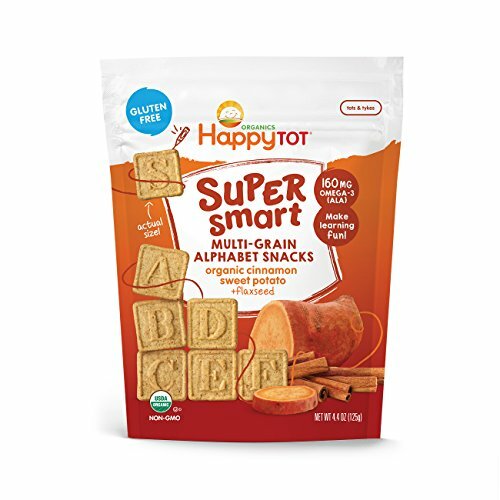 Our delicious Super Smart multi-grain alphabet snacks deliver yummy organic ingredients and 160mg of Omega 3 (ALA), an important nutrient for growing toddlers. Featuring letters of the alphabet, these tot snacks are a yummy, creative way for your little one to learn their ABCs. Our tasty cinnamon and sweet potato Super Smart multi-grain alphabet snacks spell out ‘goodness’. Made with wholesome ingredients—organic buckwheat flour, flax seeds, real sweet potatoes and a touch of cinnamon—these multi-grain toddler snacks deliver 160 mg of Omega 3 (ALA) to support happy growing and encourage playful, fun learning. Help your tot grow leaps and bounds, from the inside out!